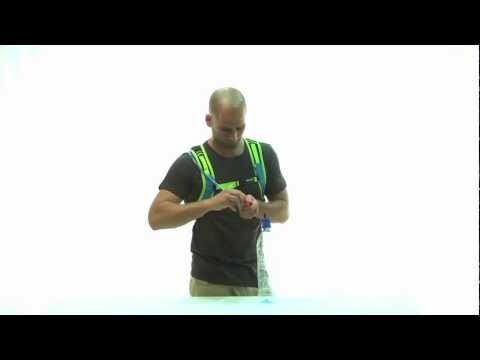 The rapid hydration refill kit is our groundbreaking solution to refill your hydration system 'on the move' - without opening your backpack or even taking it off your back (patent pending). Thanks to SQC, SOURCEs Quick Connection technology, the UTA plugs into any Hydration System with SQC push-button convenience. SQC UTA adaptor - Fits almost every bottle and tap, connects to the tube with SQC Quick Connect in place of the drinking valve. SQC Co-ex tube - Get extra reach with this drinking tube, equipped with SQC connectors on both ends. SQC Helix Drinking Valve - SOURCE Valve with SQC Quick Connector. * What is SQC?- Source Quick Connect (SQC) provides push-button convenience for fast and easy disconnection and connection of drinking tube and valve, and attachment of various accessories like the UTA or in-line filters. When disconnected, the SQC-auto-lock seals both loose ends watertight, which means you can exchange the tube or accessories also when the reservoir is full. Très pratique ! Permet de vider une bouteille d'eau directement dans la poche à eau en un tour de main. Je recommande l article . "Very practical ... I recommend this product" - Thank you, merci Philippe for your review! If you're refilling using a bottle (ideally squeezable) or a running tap, it's fine. But the first time I tried pouring into it using a flask, the inflow was really slow, and would spill out. After some trial and error, I realized that the water pressure needs to be high enough for proper refilling. It worked when I lifted the flask up higher from the valve. But you need really steady hands to avoid spilling. Thanks for the feedback and for sharing your experience with our UTA Rapid Refill Adapter! Enjoy the outdoors with SOURCE! Love the UTA™ for so many reasons. Very innovative and effective. This shortens our transition times and is super convenient in every application. Make sure it is all the way in the rubber adapter before you turn on the water or turn he bottle upside down. Buying one for every bladder we own. Richard is out running through the city, getting to know his gear before leaving for the jungle. Being equipped with Source's Universal Tube Adaptor, he's able to fill his Widepac hydration system on-the-move, without removing his pack from his back!
" Rapid refill at its finest..."
" The UTA adapts to everything... "